Meet us at Booth #316. We’ll waive your EZMealApp setup fee! 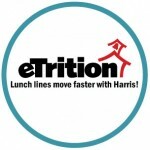 eTrition incorporates 40+ years of K-12 user experience into a fully integrated web-based school nutrition solution with Point-Of-Sale, Menu Planning, Purchasing, Inventory, and Nutritional Analysis modules; as well as easy lunch money and meal application solutions with Harris’ own EZSchoolPay.com and EZMealApp.com add-ons!